Worthing booked their spot in the FA Cup second qualifying round after overcoming division-lower Bostik League South East side Faversham Town yesterday. Midfielder Darren Budd, David Ajiboye - his fifth goal in six games since joining from Brighton in the summer - and James Crane got the goals to wrap up a 3-1 first round qualifying win at the Shepherd Neame Stadium. Budd's effort was the difference between the teams at the break but the home side levelled through Matthew Bourne minutes after the restart. Worthing would regroup and progress, collecting £6,000 in prize money, as efforts from Ajiboye and Crane took them to victory. Adam Hinshelwood's side entered the competition still unbeaten, having won four and drawn the other of their opening five Bostik League Premier Division matches this season. 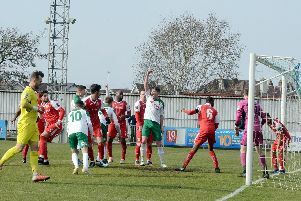 Experienced Budd got his first goal of the campaign after 27 minutes and Worthing would have hoped to kick on from there. Faversham got back in it, levelling through Bourne four minutes after the interval as the visitors had a real tie on their hands. Ajiboye notched his fifth in six games for the club soon after then Crane wrapped up the win 17 minutes from the end. Worthing discover their second round qualfying opponents tomorrow and are in cup action again on Wednesday - this time travelling to league rivals Leatherhead for a Velocity Trophy first round clash. WORTHING: Covolan; Colbran, Racine, Rents; Crane, Budd, Edwards, Rance; Ajiboye, Starkey; Kealy. Subs: Pearce (Kealy), Clarke (Edwards), Aguiar (Rance), Ovenden, Skerry.